Veľké Leváre is located in the Záhorská Lowlands, in the Malacky District. 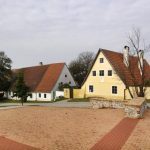 The monument reserve comprises the Habani yard, set up in 1588 on the basis of an agreement between the Anabaptists from Brodské with Count Ján from Lembach and the town Veľké Leváre, as one of about 30 fraternal yards in Western Slovakia. Habani, who engaged in several crafts, were characteristic by their common use of large detached houses situated in an imaginary quadrangular network. The chapel of the Visit of Virgin Mary is part of the built-up area. The oldest buildings date from the 17th century. Originally, in the ground floor houses made of adobe brick or beaten-in earth, there were large halls with centrally-situated columns bearing the ceiling joists. They were used, for example, as communal workshops or places for eating communal meals. The pantries in the loft spaces were separated by wicker-plaited earth-smeared constructions. The unusually voluminous houses, originally covered with thatched roofs, are characteristic of this reserve. There are 25 structures found here that have been declared national cultural monuments.